A Gothic Jardiniere - Brass & Copper, Stamped Paul Beau & Co/Montreal, within a circle, stamped twice on bottom. 1910-1920. One of the few Canadians who was able to devote his career to the execution of his own hand work was Paul Beau, a metal craftsman from Montreal. Paul Beau was born in Montreal, November 1, 1871. He began his career as a dealer in antiques and watches. After 1906, Paul Beau & Co. refer to themselves as Artistic Metal Workers offering Antique Art Goods, Old Clocks, Ancient Arms, Brass and Copper Jardinieres. He maintained a shop and residence from 1915 - 1922 at 291 Mountain Street in Montreal. Paul Beau was part of the Arts and Crafts movement in Canada. With the onset of cheap and rapid methods of machine manufacture in the applied arts, quick profits quickly outweighed the respect and demand for the craftsman-artist. Beau refused to rely on machines and worked in the tradition of the early European metalsmiths. A characteristic feature of Beau's works is the combination of metals of contrasting colours, such as employing brass for the body of an object and trimming it with decorative bands of red copper. The style of Beau's works would vary from jardiniere of Gothic inspired motifs, or an urn of classical shape ornamented with Greek geometric patterns, to a letter box with embossed naturalistic leaves after British arts and crafts design. Beau was fond of adding ornate, cast brass plaques or handles and feet to his pieces, while keeping the main body of the piece as simple as possible. Often, Beau would treat the brass with chemicals to produce a dark brown shiny patina which was intended to give the piece an antique look. 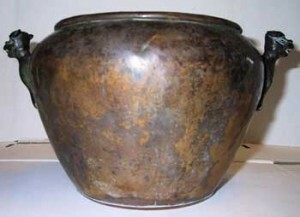 This antique or bronzed appearance was admired by Beau's clients and often preferred to the bright lustre of new brass. 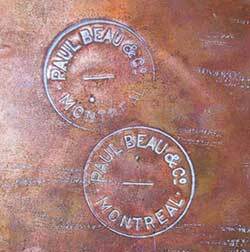 To identify his work, Paul Beau usually, but not always, stamped the metal with his mark: PAUL BEAU & Co/MONTREAL within a circle. This is the most common form of his mark but some pieces (late 1920's to the 1940's when Beau no longer ran his shop) are known to simply bear the name, PAUL BEAU. Paul Beau received some recognition for his first architectural commissions from the Montreal firm of Edward and William S. Maxwell. The Maxwell brothers were responsible for many domestic residences and public buildings in Montreal including hotels, railway stations and civic buildings in other Canadian cities. According to the architects' record books, Paul Beau executed on a regular basis from 1903 to 1916, creating electric fixtures, fireplace accessories, door hardware, wrought-iron grilles, lanterns and even weather vanes for the Maxwells' buildings. As a result of his reputation as a metalsmith, Paul Beau was commissioned to undertake the ornamental hand-wrought ironwork in the Centre Block of the Federal Parliament Buildings in Ottawa. For Paul Beau, this Ottawa commission was the high point in his career. In the 1940's, Beau was in his seventies and found little demand for his work. Metal was scarce due to the war when copper and brass were needed for bombs and ammunitions rather than decorative metal artwares. In his seventy-eighth year, a forgotten artist and in a difficult financial position, Paul Beau took his own life under the large cross atop Mount Royal overlooking Montreal.